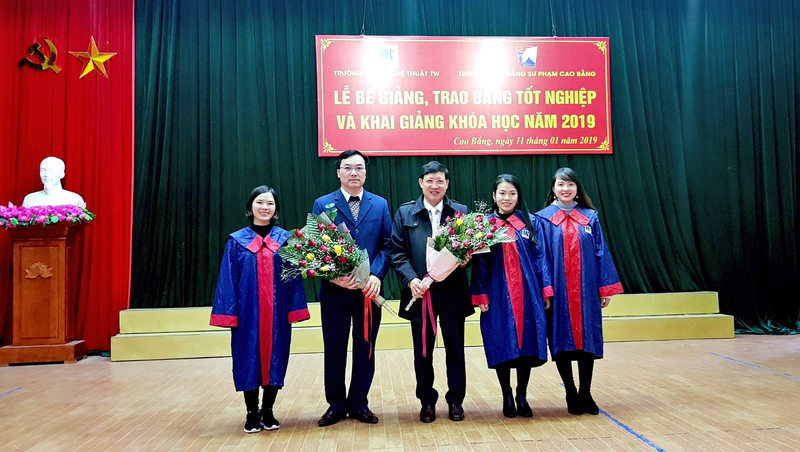 In the afternoon of January 11, 2019, at the Cao Bang Teachers’ Training College had taken the graduation ceremony and the opening of the 2019 course of Education Music which is inter-college transfer with the National University of Art Education. Attending the ceremony, on the side of the National University of Art Education, Assoc. Prof. Dr. Dao Dang Phuong, Secretary of Party Committee, Rector of the University; towards Cao Bang Teachers’ Training College with MA. Dinh Ngoc Luong, Secretary of the Party Committee, Principal of the College and comrades are officials and lecturers of the two institutions; new graduates of Inter-college transfer of Education Music of Course 1 and Course 2. Speaking at the ceremony, Assoc. Prof. Dr. Dao Dang Phuong congratulated new graduates and new students on the results achieved. Through the time of studying effort, with the energy, determination of students, the attention and support of leaders, officials, lecturers of two institutions, Inter-college transfer of Education Music course 1 has successfully completed the task, continues to bring talent and enthusiasm, contributing to the construction and development of the province. Following the students of the first course, the next course was successful admitted, officially entered the second course. The achievement of the previous class was an encouragement, a great motivation for students of the next course to gain innovation, be positive and fulfill better learning tasks. At the ceremony, MA. Dinh Ngoc Luong, Secretary of Party Committee, Principal of Cao Bang Teachers’ Training College also expressed his thanks to the National Unversity of Art Education for accompanying and training the inter-college transfer of Education Music and Fine Arts Courses, through which the collage contributes to the implementation of socio-economic targets of the People's Committee of Cao Bang province. At the same time, he congratulated the first graduates and the new students of the second course with the results, wished that they will further develop their achievements to contribute worthyly to the accomplishment of assigned tasks and contribute building the culture and education of Cao Bang province in the future. Also at the ceremony, representatives of the new graduates of the course 1, student Dinh Thi Ngoc expressed her deep gratitude to the concern and help of the cadres, lecturer of both institutions. Although they are working in many fields, being able to continue studying and improve their qualifications is very important and meaningful. Students want to continue to contribute and help the students to follow the path of learning and receive new opportunities in the context of the new innovation education sector in general education program. Representative of National University of Art Education, Dr. Le Vinh Hung, Head of the Department of Music Education has announced the decision to certify graduation for 47 students of the Inter-college transfer of Education Music course 1, the form of part-time studying (2016-2018), the Decision on results of the Inter-college transfer of Music Education, the form of part-time studying the second course in 2019. On behalf of the leaders of the two institutions, Assoc. Prof. Dr. Dao Dang Phuong, Rector of National University of Art Education has awarded and congratulated the students of the first course who were honored to receive a bachelor's degree in Music Education.